Goodness, where did the time go? I seem to be missing around here more than I’m visiting. I’m not quite sure why, other than the fact that I don’t seem to have as much time set aside for writing. It may have something to do with running The Pukeko Patch, and no doubt it does to a certain extent. It may also have something to do with the fact that Mr Oh Waily has been away from home for work four weeks out of five and has only been back for a very short time. I love my kids. I love their art. I love having lots of supplies for them to dip into. I do not love the mayhem this has, and can create around the house if you are not organised and have a place for everything to live. Our shelf & cupboard unit that, once upon a time held adult related things, became a random dropping spot for anything and everything when we moved to this house. Here is the proof. 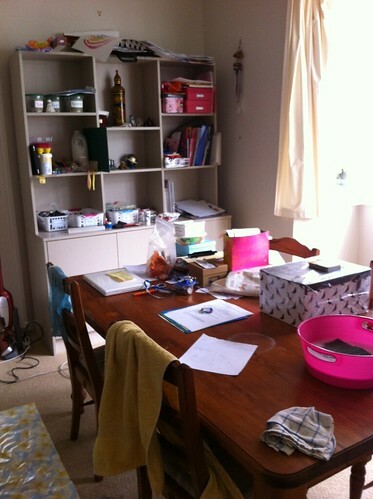 Please note that this was mid clean-up of the whole room, including our new “mucky mat” on the floor, and the dining table was also home to some items from inside the cupboards as well as cleaning materials. I promise that my home does not always look like this – only sometimes. The first, and biggest, area tackled was the piles of children’s art. I separated the art into two piles – Miss Oh and Master Oh – and enlisted the young Miss to help me decide what should stay and what should go. She did really well and I let some pieces stay that I would otherwise have thrown. The rejects were either recycled into the scribble pile or into the actual recycling. The keepers were put in Miss Oh’s now full A3 folio. I repeated the process with Master Oh’s art, only without his assistance as he would have wanted to keep every random scribble and small squiggle. That alone made a huge difference, as you can see from the before photograph there was a huge pile on the top of the unit and another on the lower left side. The loose art and craft items on the left were rehoused in a large plastic bin as part of the makeover I mentioned earlier, so that cleared out another shelf. Finally the games and toys laying about were rehomed, most of them in the cupboards below. 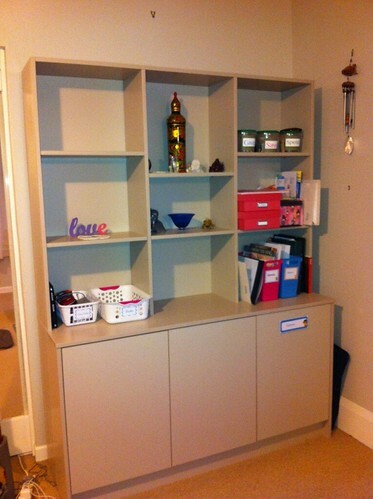 And here is the final result which, rather shockingly, has stayed almost as tidy since completing the clear out. There are a few more items on the shelves now, including another couple of magazine/filing boxes and a few other ornaments that were living elsewhere. But such an improvement. I’m very happy. so good to see you again!